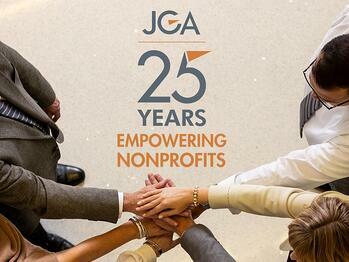 As JGA prepares to celebrate its 25th Anniversary, it is timely and appropriate to pause and look back on a quarter-century of service to the field of philanthropy and the growth that has taken place during that time. Total US charitable giving has grown from $185.83 billion in inflation adjusted dollars in 1994 to $410.02 billion in 2017. During its 25 years of service, JGA has supported our clients in their work by contributing nearly $400,000 in support of client campaigns. Giving to education has grown by 170% in the last nearly 25 years, from $21.81 billion in 1994 to $58.90 billion in 2017. JGA has historically had a large base of education clients, and has served more than 125 colleges, universities, and independent schools in the last 25 years. Since 2000, JGA-guided campaigns for educational institutions have raised more than $1.27 billion. In 1994, JGA had six clients, including Manchester College, White River State Park, Second Presbyterian Church, the Houston Zoo, and Flynn Memorial Community. Today, JGA has a diversified client base of nearly 70 education, health, faith-based, arts and cultural, and community organizations across the U.S. And, in our 25th year, we are proud to be back serving Manchester University today. Giving to health causes has grown 175% since 1994, to $38.27 billion in today’s dollars. JGA’s work with the Eskenazi Health Foundation in 2014, saw the hospital receive a $40 million gift from Sidney and Lois Eskenazi, one of the largest gifts to a public hospital from an individual donor at that time. Giving to human services has grown from $14.97 billion in inflation adjusted dollars in 1994 to $50.06 billion in 2017, an impressive 234% increase. One of JGA’s longest client relationships has been with The Villages of Indiana, whom we have served for 17 years.